Welcome back to day 2, everyone! Today's post is brought to you by Pam, who has a fabulous blog called Gingerbread Snowflakes. She has numerous Christmas and Advent posts, makes amazing shaved wood ornaments, and dabbles in everything from embroidery (love that piece!) to knitting, crocheting, and weaving (plus much much more!). I'm so pleased she is participating again this year after sharing these beautiful Scandinavian Luminaries last year, a Sami Christmas Elf the year before, and this delicious Palaeg Choklad recipe in 2011! Huge thank you to Pam for participating again and bringing this adorable Lucia Court tutorial to us! After posting this image of St. Lucy, Star Boy, and Winter Holiday Gnomes a couple years ago, I have received requests for a tutorial. What better place to provide that than here on Scandinavian Christmas! 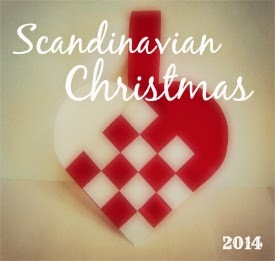 I am thrilled to be a part of Kathryn's Scandinavian Christmas again this year! First of all because this is a perfect place to come to celebrate 12 whole days of holiday cheer! And because I am a huge fan not only of all thing Scandinavian, but especially Scandinavian Christmas. So much so that I leave Kathryn's Scandinavian Christmas button up on my blog all year long so readers of my blog have instant access at any time! And now let's get to the business of making ST. LUCY AND HER "COURT"
Most of what you will need to construct these sweet, fiber-y figurines should be available in most crafty households. - 7" (18cm) tall paper cone : I use (and recommend) heavy weight cones used to wrap yarn available from Yarnia PDX, but paper (or even styrofoam) cones found at craft stores will work. - Needle felted or wet felted wool ball (or a wooden ball) approximately 1 3/4" to 2" (4 1/2 to 5 cm) in diameter (for the head). - Small birthday candles (white is traditional), a wood, foam or felt star, foam disk (or make one from cardboard) approximately 2" (5cm) in diameter and 3/8" thick - (I save the foam disks that are part of the packing used in containers of CD's). And now! Let's make Lucy and her Court! 1. Wrap the cone in white yarn. I have found that Mod Podge works best for this step. Brush on about 2" (5cm) at a time, wind, brush, wind. Begin at the top, letting the end dangle inside the cone, and work toward the bottom. Be sure to wind the yarn so that none of the cone surface shows. 2.When you get near the bottom edge of the cone, apply a fairly liberal coat of Mod Podge, wind to the very edge and slide the yarn into the tiny wedge. (If your cone does not have one, make one prior to winding). 3. Cut the yarn leaving about a 2" tail and bring it up inside the cone. Secure with masking tape. Place the cone upside down in a glass jar and let dry about an hour. 4. Once the bottom edge has dried, place the cone on the bottom edge and glue the ball to the top. Hot glue is a good choice because it holds well and dries quickly - in fact if you are using a wood ball it is really the very best choice. But Elmers will work well for the felted ball if you prefer - just a longer drying time - overnight is best. While the cone/head assembly dries, make Lucy's crown. Note: When I created the original Lucy crown, I cut little leaves from Mod Podge film colored with green food coloring and glued them onto the foam base once the candles had been glued in place. I love the look, but regret that 1) I didn't make more leaves, and 2) I didn't think to wrap the disk in green yarn. If you like this look, mix a little Mod Podge with green food coloring, spread a thin coat on a piece of wax paper and when dry cut into leaves. Or you could consider substituting little leaves cut from felt or even paper. For the "new" Lucy crown, (sorry about the yellow candles - thought i had more white!) I first corrected my original error and wrapped that little disk in green yarn. I used a bumpy yarn for the effect, but any green yarn would work. 2. Wrap the disk with yarn. 3.Secure ends by burying them in the wrap. 4. Cut a disk from green felt and glue it to the bottom of the crown. 5. Carefully remove tooth picks (one at a time), add a spot of glue in the hole and insert a birthday candle gently pushing and twisting until it rests against the felt base. (I prefer using Elmer's Glue for this step because it will seep into the holes with the candle and provide a good bond when dry. A hot glue gun will likely melt the foam and the candle!) Let dry. If you have needle felting equipment available, you can simply needle felt strands of pretty yellow yarn onto the felted ball to create hair. Begin at the forehead and work back across the crown and half way down the back of the head. Begin with strands of yarn about 10" (25cm) then trim the yarn to desired length. If you are using a felted ball for the head, but do not have a felting needle, you can embroider a chain stitch from the forehead across the crown to mid back and then draw two or three strands of yarn through each chain stitch. I sometimes add more near the front because i have a thing for "big hair"! Or strands can be glued in place using Elmers , Mod Podge or a hot glue gun. If you are using a wooden ball, glue will be the only option!! Hot glue gun will be the fastest method. Glue the crown onto Lucy's head and tie a red yarn around her waist! And now for the Star Boy! He will be constructed in much the same way using a yarn wrapped cone and felt ball head. However, as Star Boys are usually younger and smaller than Lucy, the cone must be cut in half before wrapping! Measure the cone down from the top edge 4" (10 1/2 cm), mark and cut using a craft knife. Be sure to cut a little wedge in the bottom edge for the yarn. Note: The bottom half is perfect for making the fat little gnome! Hair is easy peasy - as you can see! Needle felt or glue a few short strands into place! Draw a pattern for the hat using the dimensions shown above. Add about 1/2" to bottom of one side tapering to nothing at the top for overlap. Cut paper pattern and then cut a white felt hat using the paper pattern. Whip stitch the back seam - tapering to nothing at the top point. Place hat on Star Boy's little head, adjust and glue! Glue a yellow felt star or a wooden star to the center front. The short fat gnome is made in a similar fashion. However, his head is larger - 2 5/8" (7cm) in diameter. You could, if you wish even use styrofoam for his head as not any of it will show. The beard is needle felted on. I used white wool roving. But big white cotton balls cotton balls or fluffy yarn would also work and can be sewed or glued into place. A little needle felted nose is an important feature. But again, one could be fashioned using a bit of a cotton ball rolled tightly into a ball. The hat is very tall and somewhat scrunched! It must cover all of his face and head except his nose! Use the pattern dimensions shown when cutting a paper pattern, again adding 1/2" to the side at the base edge and tapering to nothing at the top. Whip stitch the seam and place on his head scrunching down a little! The tall thin gnome is made using the same technique as is used for Lucy. The hat pattern is the same as that used for Star Boy. And the sleeves are fashioned using the pattern dimensions above. A simple running stitch is all that is needed to hold the seam and then the sleeves are glued to the body sides as shown. Easy, inexpensive, cute and very Scandinavian! Happy and Joyous Scandinavian Christmas to all! Pam, you create such beautiful treasures . Lucy is just darling, that crown!! We are all things Lucy this weekend as we are going to a Lucia procession today! Wow, Pam you really outdid yourself! I love your idea of using birthday candles for Lucia's crown!!! They are all so wonderful! I ordered some of those cones when you made your Christmas trees. I love that you keep coming up with creative ways to use them!